So it was a weeknight. I had nothing to do and a friend invited me to the Beat Kitchen to check out this band from Phoenix, Andrew Jackson Jihad. The opener was a name that is long gone. Generic punk rock: while not entirely awful, nothing too thrilling. I was hoping that the headliner wouldn’t be more of the same and that my friend hadn't led me astray. Luckily for her, she turned out to be right. The razor-sharp, lightning speed duo that assumed said moniker that night hit me immediately. Two guys: Ben deployed with an upright bass and a guitar slung around the neck, and pseudo-singer Sean reeling off politically and philosophically anchored lyrics quicker than my brain could process. 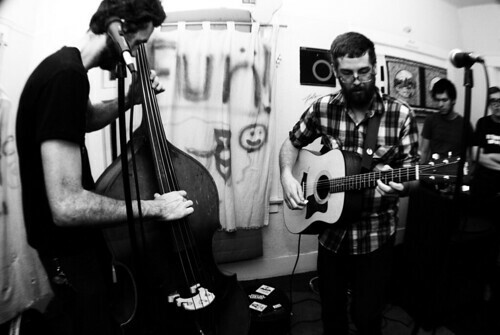 Certainly akin to other acoustic anti-folk groups such as Defiance, Ohio and Ghost Mice, it wouldn’t be unfair as well to claim them as a stripped down, sped up version of Titus Andronicus. While recordings introduce electric guitars, drums, horns, kazoos, and mandolins amongst their arsenal, they seem most at their element when entirely minimal, if only to amplify the gut-wrenchingly honest lyrics. This Friday, you've got two chances to bask in Sean’s bleak yet optimistic worldview during solo sets at the Beat Kitchen. Bomb the Music Industry opens the first show and is for people of all ages at 6:30 p.m. The second show is for the slightly more mature 17+ crowd at 10:00 p.m. with Elephant Gun and the Heat Tape opening. Both are $10.